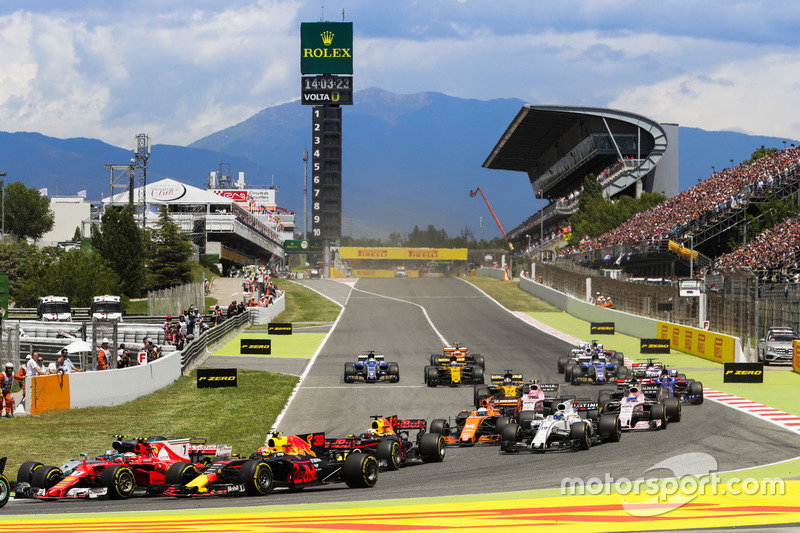 With both championships already decided, Formula 1 teams are taking advantage of the final two races to look at and understand set-up that they can't normally explore during the course of a race weekend. Their designers will have been eager to use their current cars as test mules and get real world data on parts that interest them going into 2018. Mercedes openly admitted ahead of the Brazilian GP of its desire to experiment with the W08 in the closing stages of the season, testing set-ups the team has been unable to trial while the pressure to perform has loomed. 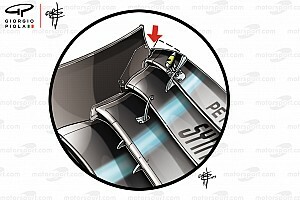 At Interlagos, the Silver Arrows focused on suspension set-up, completing back-to-back comparisons between FP1 and FP2 with both of their drivers. Some of Ferrari's focus in FP1 lay in the use of extra pressure monitors embedded within the front wing and visible in the images captured by our photographers in the pitlane. The seven additional pressure taps have been conveniently circled and numbered by the team, all of which will be married up to the data captured throughout the run and then used as part of a larger family of datasets already secured in CFD, the wind tunnel and in similar real world test runs. This information can be used by the team to better understand the performance of the wing on this year's car, while targeting any weaknesses in the design that may need to be addressed as the Scuderia looks to mount another championship challenge in 2018. This rare shot of the underside of the front wing also breathes life into a region of the car we rarely see but one that is instrumental in terms of performance. 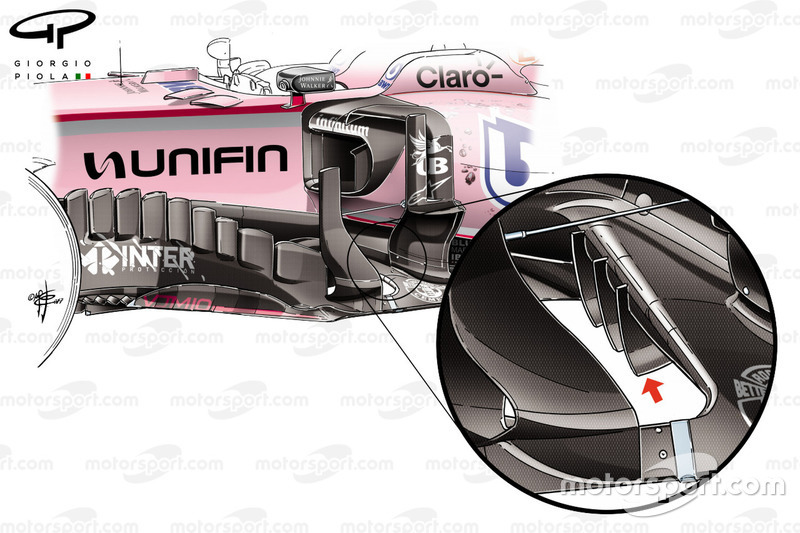 There are many takeaways from the image but the primary one is the application of square titanium plates on the lowermost points, used to protect the underside of the wing from the track's surface as it pitches forward under braking or more naturally collides with the volatile and bumpy track surface of Interlagos. Also worth noting is the shape and thickness of the strakes that reach back behind the wing differ as they work their way across the wing and direct airflow across the face of the tyre, reducing the wake it generates. 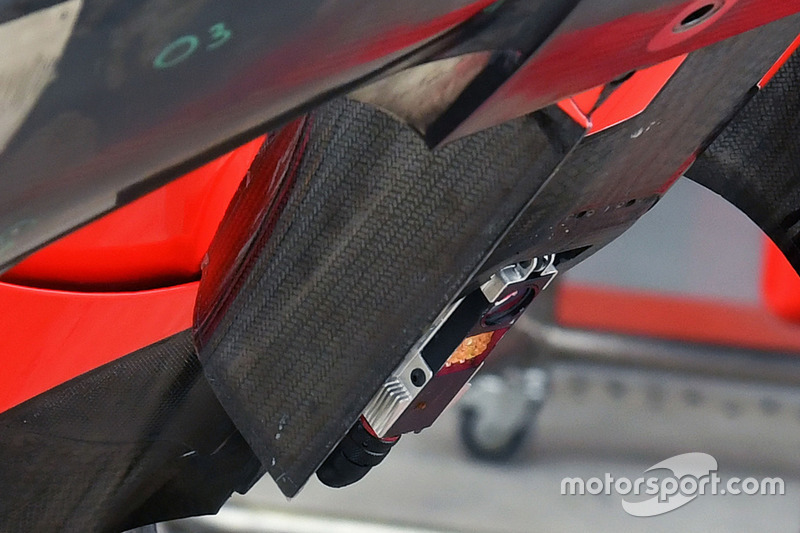 Also worth noting, as the data gathered from it will be used in unison with the additional pressure taps on the front wing, is the optical ride height sensor that has been embedded in the underside of the nose, used to measure the distance from it to the track surface. One of the design considerations that stands Red Bull's design apart from others is the treatment of the outboard section of the front wing, with the footplate (arrowed) not only arched along its length but the leading edge of the curved element pushed back and raised to match the vertical slot placed in the endplate. The footplate creates a vortex that helps mitigate the losses associated with the wake generated by the front tyre. 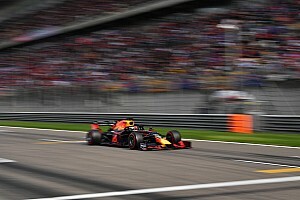 Running a steeply-raked car, Red Bull will know that if it was to use a conventional design, the vortex would be affected - as the car adopts various attitudes throughout the course of a corner that would put the leading edge into a sub-optimal working range, likely leading to the vortex bursting and creating a cascading performance drop downstream. 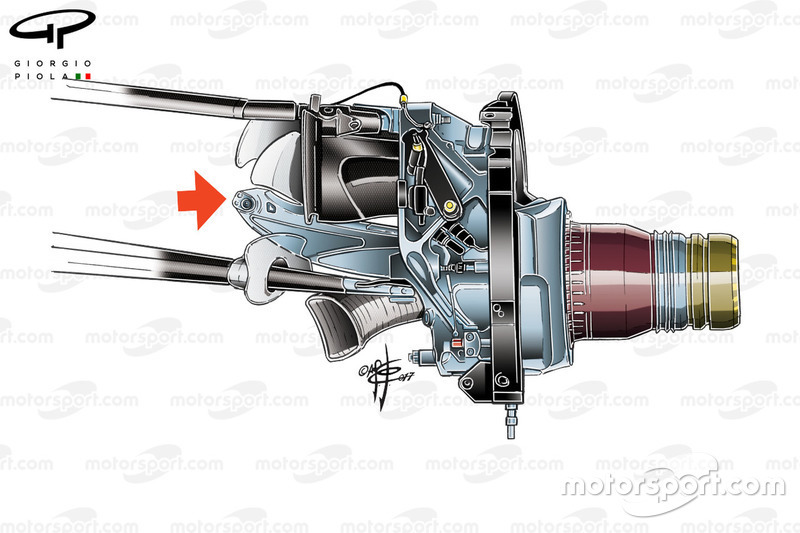 As part of the ongoing investigation into next year's car, Red Bull has tested a new suspension layout at the last few races, featuring a revised pick-up point on the upright for the push rod (arrowed). 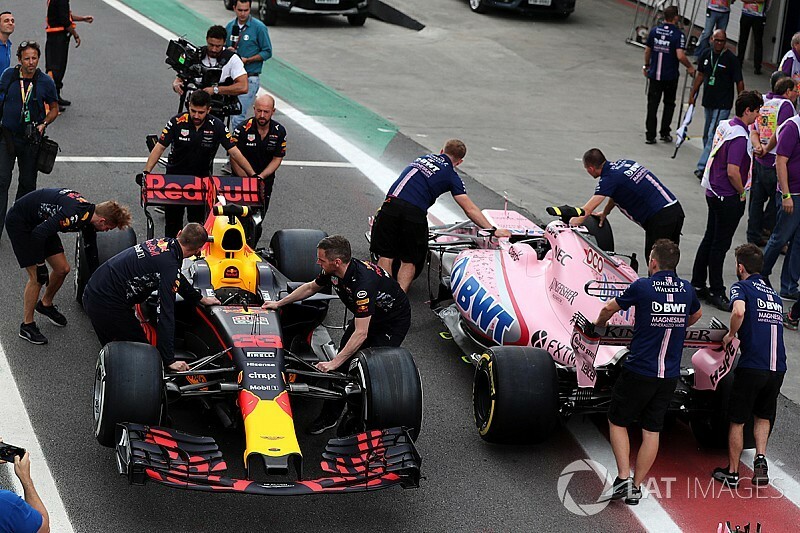 Undoubtedly the team is looking at ways to refine the car's ride handling characteristics and reduce pitch stiffness in order that the aero platform is improved as a secondary function. Force India introduced a new monkey seat for the VJM10 several races ago but as part of a continued push to improve performance, part of the leading element of the winglet has been treated to gold leaf in order to reflect heat generated by the exhaust that lies within its path. 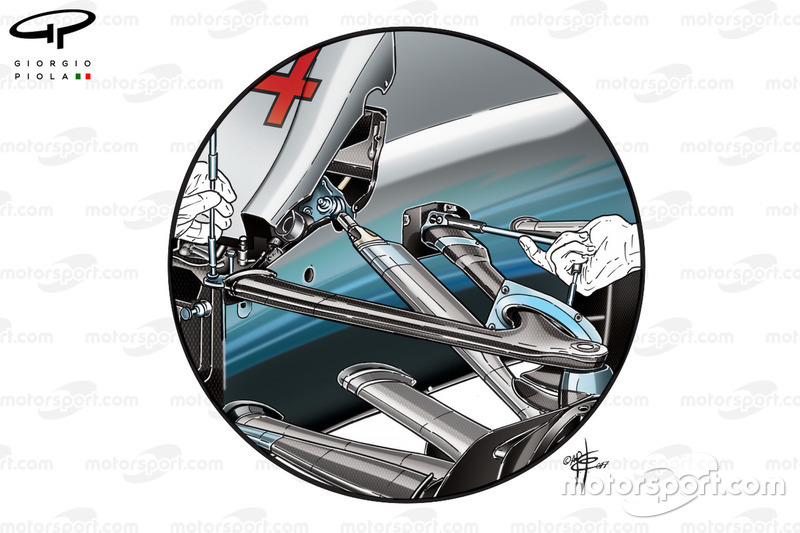 Force India's introduction of new parts at the last round in Mexico included a design already found on the W08 and RB13 - leading edge floor strakes. The team didn't race the new floor in Mexico but as part of the investigative work undertaken in Brazil, the floor was tested once more, with the team eager to understand how performance can be gained from their use ahead of 2018. 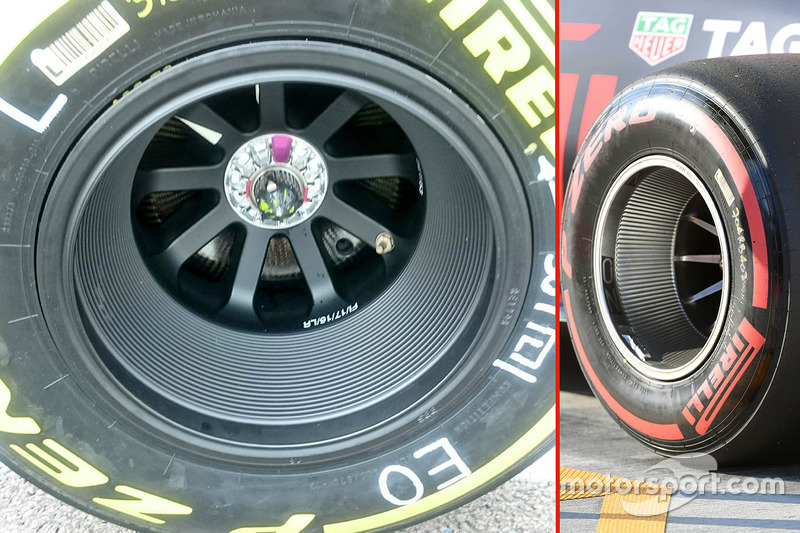 Force India also trialled a new rear wheel design, featuring ridges that follow the circumference of the rim. 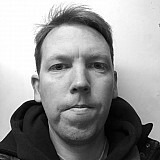 It's expected that they offer a two-fold effect. Firstly, from a tyre performance perspective, they increase the wheel rim's surface area at the face, changing the thermal interaction between itself, the internal (bulk) temperature of the tyre and the cooler external airflow. Secondly, the ridges undoubtedly have an aerodynamic impact, creating a cascading flow out of the wheel well that interacts with the already turbulent wake generated by the brakes and wheel design, before interacting with the tyre's outer squish. 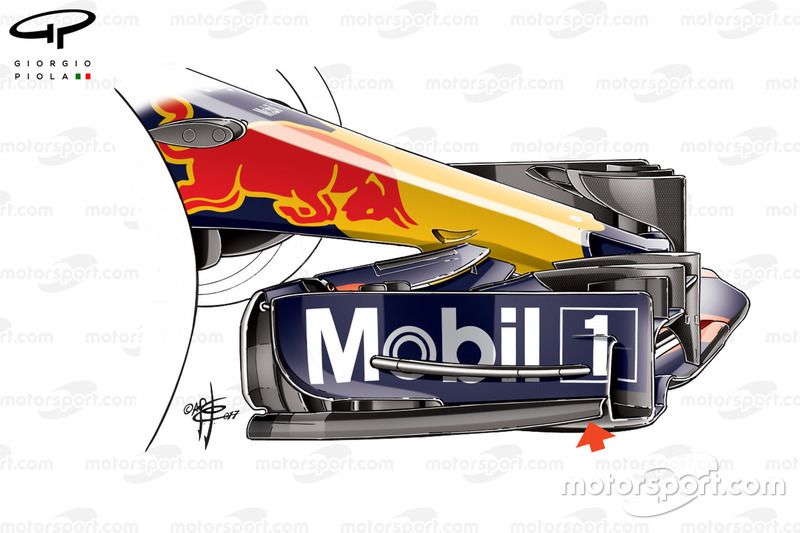 It's by no means a new design, with Red Bull having run a variation of it throughout 2017 (right), albeit the RB13's ridges are orientated in the opposing direction. It's obviously something that has piqued the interest of Force India, so much so that the Silverstone-based team has worked with its wheel supplier to come up with its own version. Driver feedback from testing these parts is one thing but gaining actual data is critical if the team wants to make further improvements, especially as its eye is now firmly on next year's car. 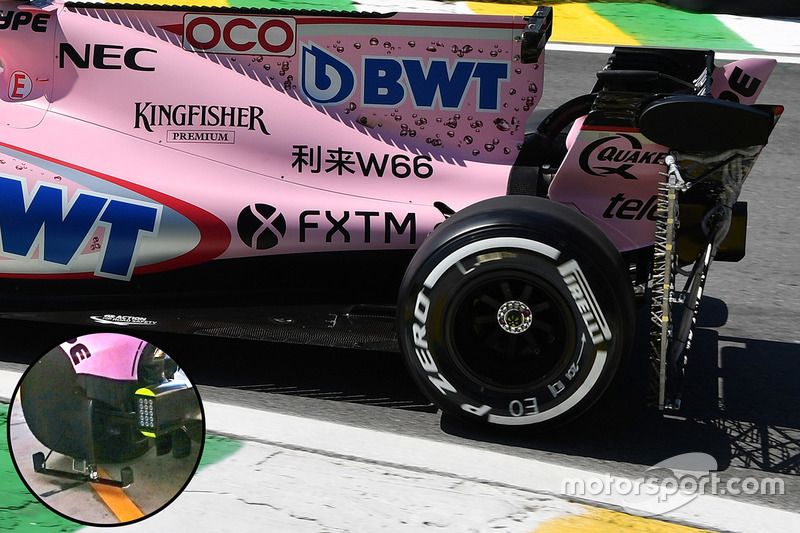 Both Force India drivers had different sensor arrays placed on the rear of their VJM10 during FP1. 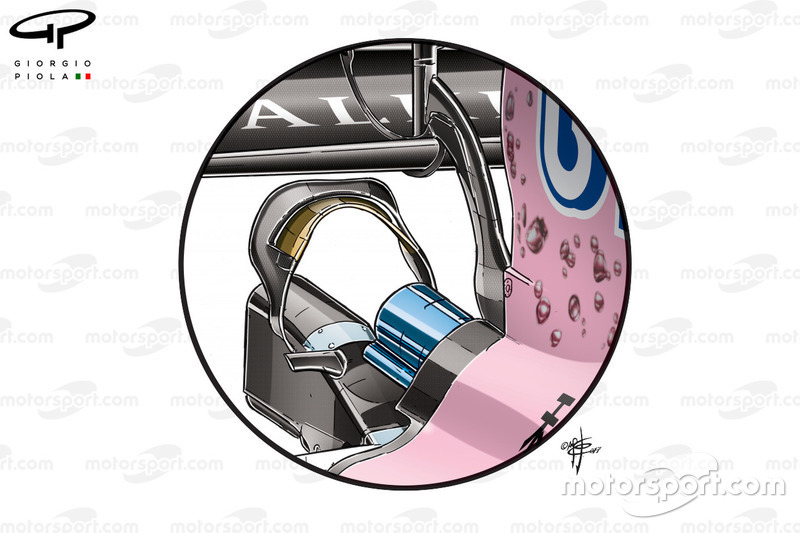 Esteban Ocon, whose car is pictured here, had a large kiel probe array, while George Russell in charge of the other car had a smaller array and camera mounted behind that wheel (inset). Renault has for some time now been shaping its efforts around the understanding of this year's car in order to influence the direction of next year's, primarily due to the fact that so little will change from a regulatory perspective. That's not to say that the RS18 will be an evolution of this year's car, with the team already clear that it has prepared an all-new design, as the factory in Enstone works flat out to maximise the increased resources presented by Renault. As part of an ongoing push toward the end of the season, Renault arrived in Brazil with the express intent of focusing its efforts on understanding critical areas of this year's car. 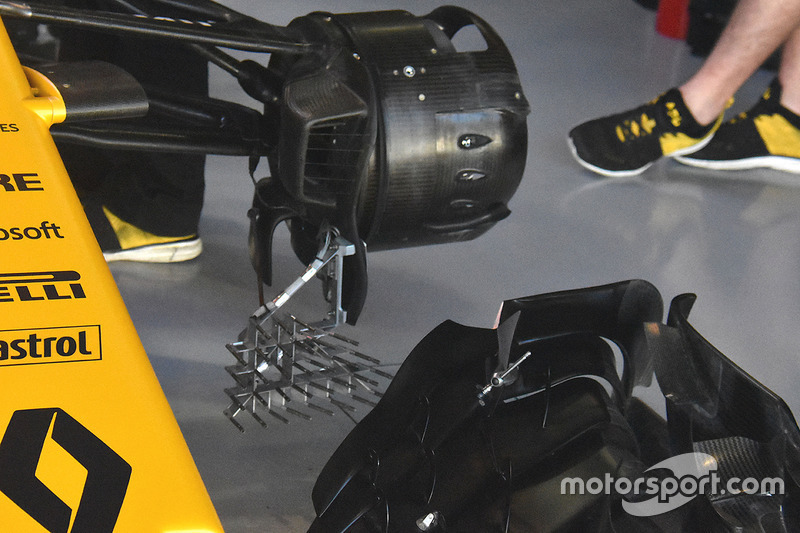 The imminent arrival of the Halo has also prompted teams to start evaluating how the safety device will impact the surrounding aerodynamic structures, with Renault attacking this in two directions in Brazil. 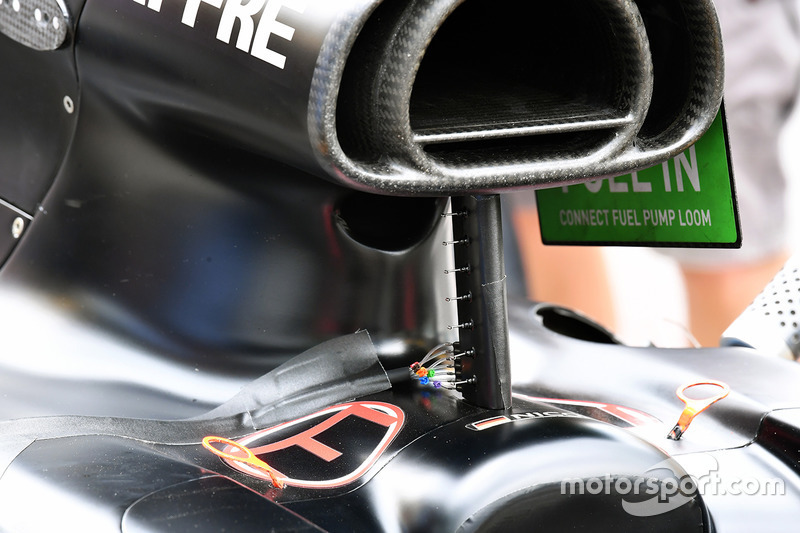 The first was to utilise a row of small pitot tubes, which could be found hung alongside the vertical airbox support spar, measuring the airflow as it passes by. 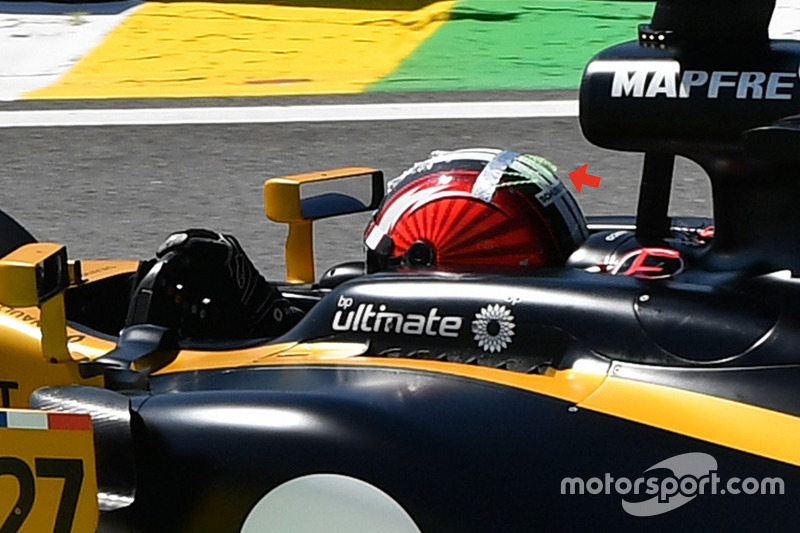 Secondly, Renault employed a rather old-school approach as the team taped a series of string tufts to the rear of Nico Hulkenberg's helmet. 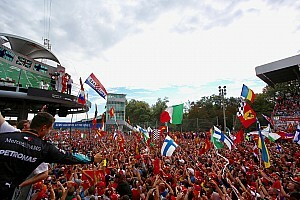 The driver, who uses a Schuberth helmet, did consecutive runs both the with and without the winglet normally residing in this position, as the team wanted to gather back-to-back results. This was monitored by a high-speed camera in order that the team and helmet designer can maximise the performance and design of the helmet in conjunction with the Halo next season. 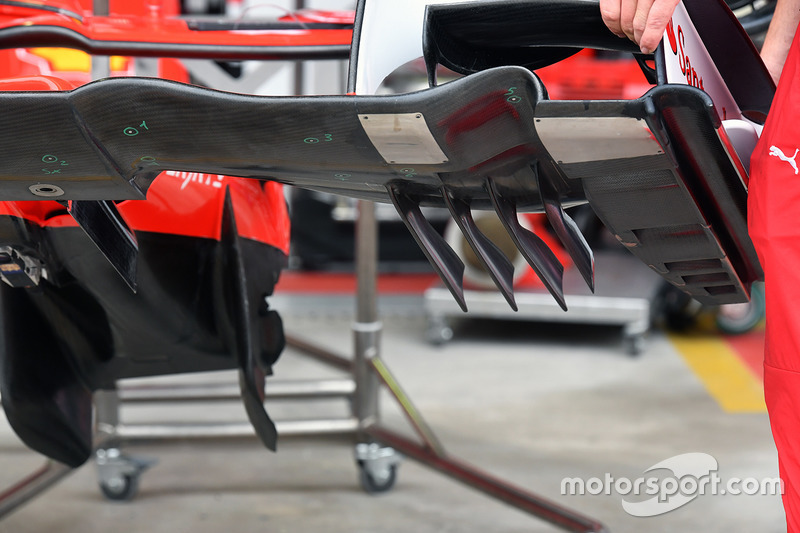 The team also placed a kiel probe array behind the front wing in an effort to understand the performance of the front wing and its role in displacing the wake generated by the front tyre.